Young girl poses in a reproduction 1895 dress covered by an antique Victorian pinafore. 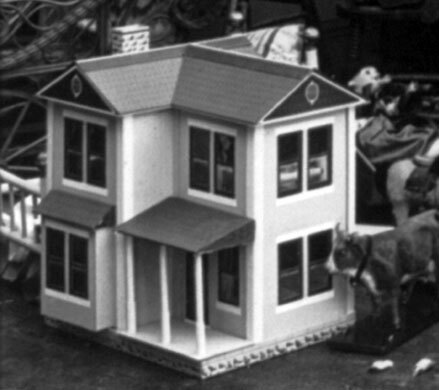 For all the delightful toys which were ever invented for the amusement of children, none have ever approached the entertainment level that dollhouses afford. The likeness to real life enables imaginative minds to adopt an existence in those tiny dollhouse rooms filled with dollhouse miniatures and to believe in the positive identity of the father and mother and all the family. 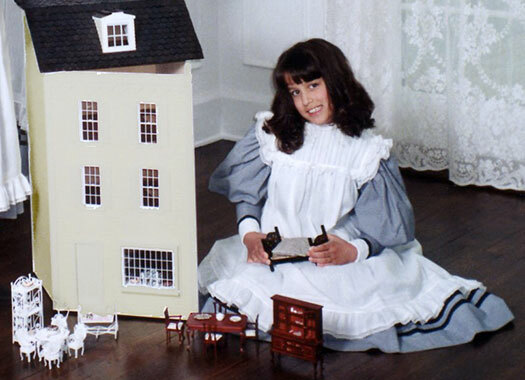 In centuries past, the keeping of dolls and dollhouses became a part of the home education of girls. 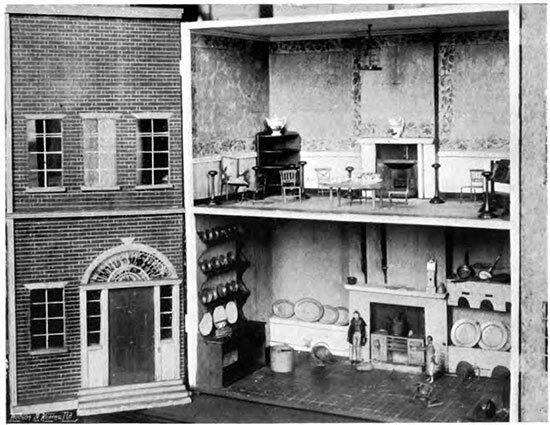 Some exceptional Victorian dollhouses were not those with four rooms, one on the top of the other without any communication but instead, consisted of three floors. On the ground floor were the kitchen and the dining room decorated with dollhouse furniture with the hall in between and the staircase which led up to the top of the dollhouse, a door each side leading to the two rooms. The Queen’s Dolls’ House at Windsor Castle is one of the largest, most beautiful and most famous dolls’ house in the world. 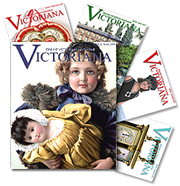 On the second floor of the Victorian dollhouse was the drawing room, a very large room opening into another, which was the children’s playroom, and through which passed the staircase. Upstairs was a narrow passage up into which the staircase ended. 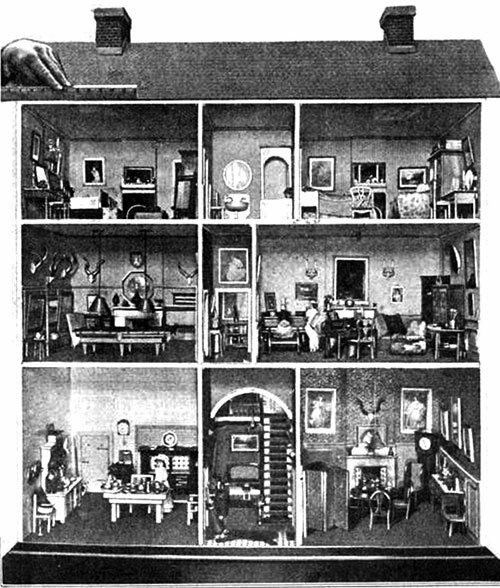 The mother’s bedroom decorated with dollhouse miniatures was a large sized room with a door through to the nursery, which was another large sized room. The dollhouse furniture throughout the house was lovely. The Victorian drawing room had a miniatures suite of red velvet, gold fringe, and ebony; a marble bureau and a marble topped table, a tiny tea table, and two extra chairs. Chimney glasses, pictures, and ornaments were distributed plentifully about the room, and above all a piano, on which the dollhouse's children practiced diligently every day. 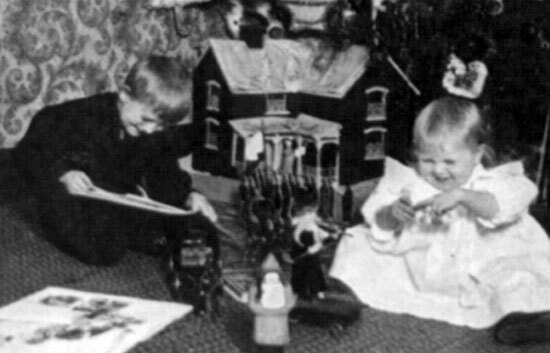 The children's playroom was filled with dollhouse miniatures toys — including a small dollhouse which was made out of a little farmhouse from a box of toys, a rocking horse, tiny dolls, etc. The miniatures beds for the Victorian dollhouse were made out of empty powder boxes in the following manner: the bottom of the box was the dollhouse bedstead itself, which was turned bottom upwards, and the lid cut nearly in half for the back and tester of the bed. The bottom of the box was sewn to the longest piece of the lid, the shortest piece being attached to the top. Round the sides of the bed was a flounce of chintz for a valance, and then covered all over the back and tester with chintz. A pair of matching curtains was tacked to the side of the tester, fastened at the side to the back. A little flounce was attached round the top to finish it off. The mattress was made of white calico because ticking was too clumsy for so small a bed, and it was stuffed with old bits of rag or even paper. A dollhouse size bolster and pillow was made in the same way, also of white calico, rendering a pillowcase unnecessary; the blankets and sheets were the easiest things to make, consisting only of small squares of calico or flannel. The quilt was made of the same chintz as the curtains, with a frill round it and some lace. When the curtains and valance of the bed were made in white, a muslin quilt of pink or blue trimmed with lace was best. 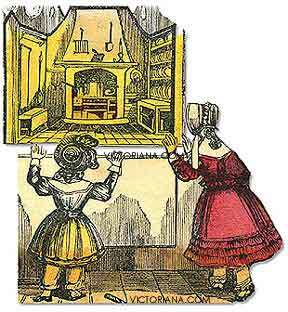 Queen Victoria's Doll House from 19th century. The dining room was very simply furnished with dollhouse miniatures — only three or four chairs, a sideboard, and the long dining table. The kitchen was chiefly filled with miniature plates, dishes, cups, saucers, etc., spread out on the sideboard; while a box of kitchen furniture, consisting of four chairs, a table, and a plate rack, completed the dollhouse furniture of that room. The ordinary routine of the house was most regular. 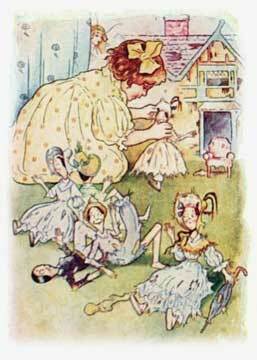 The dollhouse children were always put to bed for the night; therefore they had to be got up and dressed each day. The breakfast was then laid, and the dolls sat down. Immediately after, the mother went into the kitchen to order the dinner, etc. 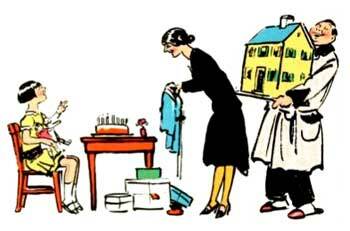 As soon as she had performed these household duties, she went into the dining room, where the children were seated and ready for their lessons, with small pieces of paper before them folded to look like copy books, other small books on the table made with many little bits of folded paper sewn together, and then a piece of colored paper folded for a cover. The antique doll's house above is a replica of an Enlishman's home in the early twentieth century. The dollhouse features old masters on the walls of the dining room with Chippendale style furniture. Upstairs thes is the drawing room and billiard room. On the third floor, besides the two bedrooms, there is a bathroom. After the lessons — at which they were employed during their owner's own studies—they took a walk along the front of the bookcase or on the mantelpiece; after which they would return to the children's dinner. Then lessons again, unless it were Wednesday or Saturday, which were the half-holidays, when they had something always provided for them to do — a little friend to tea from a neighboring dollhouse, or something of that sort. After afternoon lessons the dollhouse children's tea was spread in the nursery, and the late dinner in the dining room. Then the children were undressed and bathed, and put to bed—mother coming up to wish them good night. Then the elder daughters, with their father and mother, had music and cards in the drawing room until bed time—the papa always going round the house and locking up. 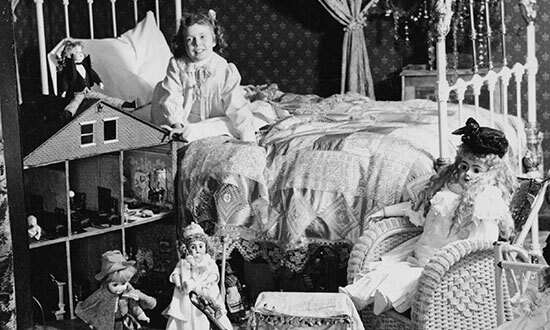 This is how the owner of the Victorian dollhouse played, and her little household was as regular as that of her mother's.